Nicorette Gum is a nicotine replacement therapy (NRT). NRT products can be used to relieve withdrawal symptoms and reduce the cravings for nicotine that you get when you try to stop smoking, or when you are cutting down the number of cigarettes you smoke while trying to stop smoking. To help cut down or quit smoking you should also try to use a behavioural support programme to increase your chances of success. If you smoke 20 or fewer cigarettes a day, the 2 mg nicotine gum can help relieve your cravings. If you smoke more than 20 cigarettes a day, 4 mg nicotine gum may be more appropriate. You may have tried to stop smoking before and you know from bitter experience that it’s not easy to give up cigarettes. However, you have now taken the first constructive step towards becoming a non-smoker. The overriding success factor in quitting is how determined you are. The first few weeks of quitting or reducing the number of cigarettes you smoke will probably be the most difficult because your smoking ritual is still fresh in your mind. However, you will find that as time goes by, your willpower becomes stronger. Telling friends, family and work colleagues that you have quit smoking and that you envisage a tough time ahead will encourage them to support you. There is never a perfect time to give up smoking, but you should plan ahead by choosing a date in the not too distant future on which you are going to give up cigarettes completely, or start reducing the number of cigarettes you smoke. Try to pick a day when you will not be too stressed. For a number of years you will have become accustomed to smoking at certain times, with particular people or in certain situations. Think about the times you will miss smoking the most and plan how you will cope on these occasions. Changing your routine will help you break the habit of smoking. Quitting with a fellow smoker is a good idea. It will strengthen your resolve and build on your determination. Encourage a friend or family member to quit with you. It will give your morale a boost since there will be another person knowing exactly what you’re feeling and with whom you can share your resolve to quit smoking. To help yourself succeed be sure to remove all cigarettes, matches, lighters etc. from your home, car and work. Ask your friends and colleagues not to offer you cigarettes or smoke close by you but be careful not to offend them. Explain that you have given up. This type of support from friends is of greatest benefit for the first couple of weeks of quitting, as this is your most vulnerable time. The last thing you want is a cigarette close at hand in a moment of weakness. When you reach your Quit Day, don’t allow yourself to think that you’re quitting for good. That will make it seem like a superhuman task. Just promise yourself “I won’t have a cigarette today” and take it one day at a time. You’ll be surprised how much that little thought helps. Whenever you feel the urge to smoke coming on, distract yourself by keeping active. Don’t feel sorry for yourself. Get up and do something. Do that job around the house or garden that you’ve been putting off or take up a hobby. Remember that the craving only lasts a few minutes. Once you have stopped smoking, taking exercise regularly will not only help you get fitter but will encourage you to relax. Exercise has the ability to relieve stress and tension. Taken regularly it will benefit you physically and psychologically. If you haven’t exercised for some time, take it slowly to begin with and increase the amount of time spent exercising over the course of a few weeks. Not only will exercising help you relax but it also helps to keep your weight under control, which some people find a problem when quitting. One of the really noticeable benefits of ‘stopping’ is the extra cash that’s suddenly available. To emphasise the point put the money into a pot marked ‘cash not ash’ and watch it accumulate. But be sure to use the money to treat yourself. You deserve a reward for not smoking. You might find that in times of stress, reaching for a cigarette is the only thing that will help you through. There may also be certain situations – particularly social situations such as a party – where temptation just gets the better of you, so you smoke one or two cigarettes. You might feel that your only option is to go back to smoking. Don’t think of it as having failed, just think through the reasons why you wanted to quit in the first place and don’t let those couple of cigarettes get the better of you. Refer back to your plan and start again. You can beat it! Giving up is more difficult for some people than others. If you fail to stop first time, don’t be disheartened. Try again at a later date – you can do it! Remember the most successful long term ex-smokers have usually had to try several times to stop smoking – if you don’t succeed – quit quit again. 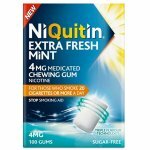 The number of Nicorette Gums you use each day will depend on how many cigarettes you smoked and how strong they are.n The 2 mg gums should be used by people who smoke 20 or fewer cigarettes each day or by heavier smokers when they are cutting down the number and strength of the Nicorette gums they are using. The 4 mg gums should be used by people who smoke more than 20 cigarettes per day. Do not give this product to children under 12 years. If you usually smoke 20 cigarettes or fewer per day, use one 2mg gum as required to relieve cravings. If you usually smoke 20 cigarettes or more per day, use one 4mg gum as required to relieve cravings. Most people use between 8 to 12 gums per day. Children aged 12 up to 18 years should not use for longer than 12 weeks without asking for help and advice from a doctor, nurse or pharmacist. Adults aged 18 years and over should not use for longer than 9 months without asking for help and advice from a doctor, nurse or pharmacist. The method of chewing Nicorette Gum is not the same as for ordinary chewing gum. Nicorette Gum is chewed to release nicotine then rested so that nicotine can be taken in through the lining of the mouth. If Nicorette Gum is chewed continuously, the nicotine is released too quickly and is swallowed. This may irritate your throat, upset your stomach or give you hiccups. If you have false teeth you may have difficulty chewing the gum as Nicorette Gum could stick to them and on rare occasions, damage dentures. If you experience a problem, other types of nicotine replacement therapy such as a skin patch, inhalator or microtab may be more suitable for you. Because smoking is an addiction, you may find it difficult to give up. From time to time you may still have strong urges to smoke but if you follow these recommendations, you have a good chance of quitting. Some people may find it easier to set a quit date and stop smoking immediately. Others who are unable or not ready to stop smoking abruptly, may benefit from gradually reducing the number of cigarettes they smoke each day until they feel able to stop completely. If you are an adult you can follow either one of these options. However children should follow the guide to stopping immediately as the recommended duration of nicotine replacement therapy in children is 12 weeks maximum. The only time children should stop gradually is if they are having a problem stopping immediately and they should talk to their doctor, nurse or pharmacist beforehand. 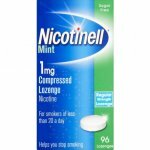 If you find it hard to stop smoking using Nicorette Gums, you are worried that you will start smoking again without them or you find it difficult to reduce the number of Nicorette Gums you are using, talk to your doctor, nurse or pharmacist. Remember Nicorette Gums are not intended as a substitute for smoking, they are an aid to give up. The idea is to stop smoking immediately and use the gum to relieve the cravings to smoke. After achieving this you then stop using the gums. There is a difference in how you stop depending on whether you are aged 12 – 18 years or are 18 years or over. Make sure that you follow the instructions for the age range applicable for you. Set a date to quit and stop smoking cigarettes. Use the gum for up to 12 weeks (3 months) to relieve your cravings to smoke. Start to reduce the number of gums you use. You should try to use fewer pieces of gum each day. When you are using only one or two pieces per day, you should stop completely. For those using the 4 mg Nicorette gum, the use of 2 mg gums may be helpful when withdrawing from treatment. If you need to use the product for longer than 9 months, ask your doctor, nurse or pharmacist for advice. You might feel a sudden craving to smoke long after you have given up smoking and stopped using Nicorette Gum. Remember you can use nicotine replacement therapy again if this should happen. Use the gum for 8 weeks (2 months) to relieve your cravings to smoke. Reduce the number of gums you use over a period of 4 weeks. You should try to use fewer pieces of gum each day. When you are using only one or two pieces per day, you should stop completely. For those using the 4mg Nicorette gum, the use of 2 mg gums may be helpful when withdrawing from treatment. Do not use for longer than 12 weeks in total without asking for help and advice from your doctor, nurse or pharmacist. The idea is to start by gradually replacing some of your cigarettes with the gum. After achieving this you then give up cigarettes completely while using the gum. Finally, you give up using the gum. Work out how many cigarettes you smoke per day. Set a date to start reducing the number of cigarettes you smoke. Start reducing. Over the next few months, reduce the number of cigarettes you smoke by using Nicorette Gum when you feel the urge to smoke, until you feel ready to stop completely. If after 6 weeks you have not reduced the number of cigarettes you smoke, ask your doctor, nurse or pharmacist for advice. You should aim to stop smoking completely by six months from the beginning of treatment. Stop smoking. Cut out all cigarettes and continue using the gum for up to 3 months to relieve your cravings to smoke. Start reducing the use of the gum. You should try to use fewer pieces of gum each day. When you are using only one or two pieces per day, you should stop completely. Children should follow the guide to stopping immediately. The recommended duration of nicotine replacement therapy in children is 12 weeks maximum. The only time children should stop gradually is if they are having a problem stopping immediately. Talk to your doctor, nurse or pharmacist before attempting to stop gradually. Do not use Nicorette Gum if you have an allergy to nicotine or any of the other ingredients. if you are pregnant or breast-feeding – you may be able to use nicotine replacement therapy (NRT) to help you give up smoking but you should try to give up without it. if you have an overactive thyroid gland or have a phaeochromocytoma (a tumour of the adrenal gland that can affect blood pressure) – your doctor will have told you this. if you have diabetes – monitor your blood sugar levels more often when starting to use Nicorette Gum as you may find your insulin or medication requirements alter. The chewing gum base contains butylated hydroxy toluene (E321), an anti-oxidant. May cause local skin reactions (e.g. contact dermatitis) or irritation to the eyes and mucous membranes. Nicorette Gum contains sorbitol. If you have been told by your doctor that you have an intolerance to some sugars, talk to your doctor before taking this medicine. If you are pregnant: ideally, you should try to give up smoking without NRT. If you can’t manage this, you can use NRT as the risks to your baby are far less than smoking, however you should talk to your doctor, nurse or pharmacist for advice. Products that are used intermittently may be preferable to nicotine patches. However, patches may be more suitable if you have nausea or sickness. If you do use patches take them off before going to bed at night. If you are breast-feeding: ideally, you should try to give up smoking without NRT. If you can’t manage this you are best to use NRT products that are taken intermittently (not patches), however you should talk to your doctor, nurse or pharmacist for advice. Breast-feed just before you use Nicorette Gum to ensure that the baby gets the smallest amount of nicotine possible. If you do need to use NRT to help you quit, the amount of nicotine that the baby may receive is considerably smaller and less harmful than the second-hand smoke they would inhale if you smoked. Tobacco smoke produces breathing and other problems in babies and children. If you have used more than the recommended dosage you may experience nausea (feeling sick), salivation, pain in your abdomen, diarrhoea, sweating, headache, dizziness, hearing disturbance or weakness. If you do get any of these effects contact a doctor or your nearest hospital Accident and Emergency department immediately. Take the leaflet and pack with you. Contact a doctor or your nearest hospital Accident and Emergency department immediately if a child under 12 years uses, chews or swallows this medicine. Take the leaflet and pack with you. Nicotine ingestion by a child may result in severe poisoning. Like all medicines, Nicorette Gum can have side-effects. You may experience unwanted effects because by stopping smoking you have reduced the amount of nicotine you are taking. You may also experience these effects if you under use Nicorette Gum before you are ready to reduce your nicotine intake. These effects include: irritability or aggression, feeling low, anxiety, restlessness, poor concentration, increased appetite or weight gain, urges to smoke (craving), night time awakening or sleep disturbance and lowering of heart rate. These effects include: feeling faint, feeling sick (nausea), headache and hiccupping (due to excessive swallowing of nicotine). Nicorette Gum can sometimes cause a slight irritation of the throat at the start of the treatment. It may also cause increased salivation. The gum may occasionally stick to dentures and in rare cases damage them. headache, sore mouth or throat, jaw-muscle ache, stomach discomfort, feeling sick (nausea) and hiccups. (less than 1 in every 10 people are affected): dizziness and sickness (vomiting). (less than 1 in every 100 people are affected): hives (urticaria),redness or itching of the skin and chest palpitations. allergic reactions (swelling of the mouth, lips, throat and tongue, itching of the skin, swelling of skin, ulceration and inflammation of the lining of the mouth). (less than 1 in 10,000 people are affected): abnormal beating of the heart. If you notice these or any other unwanted effects not listed in this leaflet tell your doctor, nurse or pharmacist. Keep Nicorette Gum out of reach and sight of children and animals. Nicotine in high doses can be very dangerous and sometimes fatal if taken by small children. Do not store Nicorette Gum above 25°C. Do not use the gum after the ‘Use before’ date on the box or blister strip. Dispose of Nicorette Gum sensibly. Medicines should not be disposed of via waster water or household waste. Ask your pharmacist how to dispose of medicines no longer required. These measures will help to protect the environment. Other ingredients are: Chewing gum base, sorbitol, sodium carbonate, flavourings, polacrilin, glycerol and talc. The chewing gum base contains butylated hydroxyl toluene (E321), an anti-oxidant. The 2 mg gum also contains sodium bicarbonate. The 4 mg gum also contains quinoline yellow (E104) (yellow colour). The gum does not contain sugar (sucrose) or animal products.